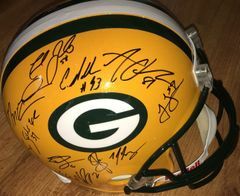 Riddell full size replica helmet autographed in black marker by 23 members of the 2010 Green Bay Packers Super Bowl 45 Champions team including Super Bowl MVP quarterback Aaron Rodgers, wide receivers coach and former star running back Edgar Bennett, Mason Crosby, star running backs Ryan Grant and John Kuhn, Nick Collins, Sam Shields, Morgan Burnett, star linebacker A.J. 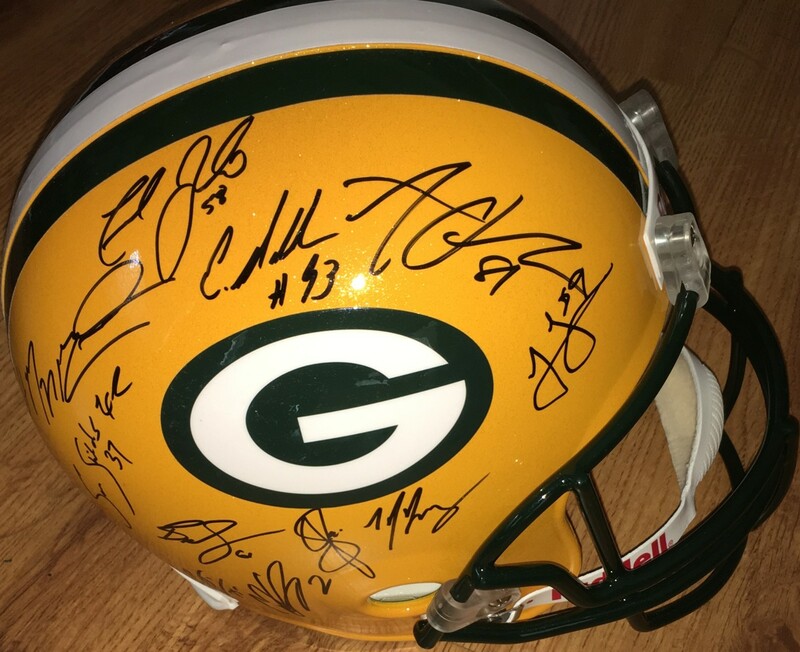 Hawk, Nick Barnett, Frank Zombo, Brett Goode, Evan Dietrich Smith, Scott Wells, T.J. Lang, Josh Sitton, Chad Clifton, Ryan Pickett, Andrew Quarless, superstar tight end Jermichael Finley, James Jones, Erik Walden and Jarius Wynn. All autographs obtained in person at the team hotel in San Diego in 2011 and 2012 except for Rodgers and Barnett, who signed it at separate celebrity golf tournaments. 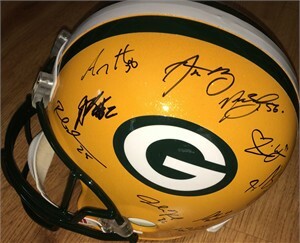 With photo of Rodgers just after signing this exact helmet, roster marked with every player who signed it and certificate of authenticity from AutographsForSale.com. ONLY ONE AVAILABLE FOR SALE.